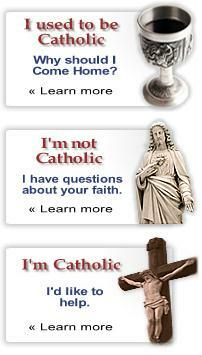 There is a very helpful website that welcomes former Catholics to return to the Catholic Church. It is a welcoming and friendly site. It also has a very interesting opening video with a nice guy stepping up and introducing the site and how easy it is to use. It has three basic sections: 1) I used to be Catholic, why should I Come Home? 2) I'm not Catholic, I have questions about your faith, and 3) I'm Catholic; I'd like to help. This is a good site to share with family and friends, especially if they have even a slight interest in returning, learning more, or if they are just curious about what YOU believe and why. They also have some interesting videos of their television ads.